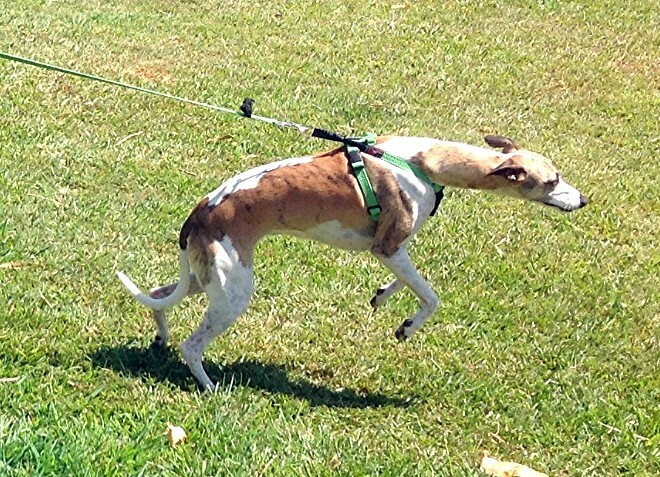 Are you looking for something different to be involved in with your Whippet? In proving that they are an extremely versatile breed, and not just a 'pretty face' - many folk have been quite amazed to learn that there are Whippets very successfully involved in the exciting sport of Tracking. In fact, most breeds of dogs are suited to Tracking - not just scent hounds as would be thought, and the sport suits people who love spending time with their dogs in the great outdoors, and have a reasonable level of fitness. Tracking is based upon the concept of Search and Rescue, where dogs are required to find "lost" people over varying distances of up to 1.2km. 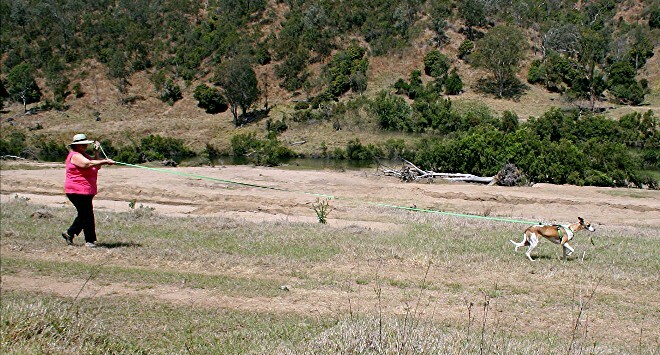 Tracking is a competition sport conducted by clubs affiliated with Dogs Queensland, and dogs can earn titles as they work their way through the various tests. The dogs work in a harness with long lead (10m) attached, and are assessed as they work by a Tracking Judge who follows along behind the handler, with a Steward, to ensure that all elements of the test have been undertaken satisfactorily. Dogs are then graded accordingly. Tracking has 7 test levels which become increasingly difficult all the way up to Tracking Champion level. From there, dogs may progress into Track and Search, which comprises another 6 levels. Tracking dogs (TD) earn the following titles: Tracking Dog, Tracking Dog Excellent, and Tracking Champion. There are no placings in Tracking. Dogs will earn a passing grade of Pass, Good, Very Good, Excellent, or a Fail. Dogs with their Tracking Champion Title are then eligible to enter Track & Search (TSD) which involves urban and even night time tracking. At the start of the track the dogs are given the scent from an article of clothing provided by the tracklayer (the "lost" person), and from there the dogs are required to follow that scent until they find the tracklayer waiting at the track’s end. The tracklayer will drop a couple of extra articles along the track and the dog must find these too. The handler never knows which way their track goes, so it is all up to their dog's nose! Weather conditions can alter scent and its properties. Heat may evaporate it, while wind and rain may disperse it. Fog tends to absorb scent particles, only to release them as the fog lifts, spreading them on the breeze far and wide. In addition, the higher level tracks will include a cross track or two. These are set by people the dog may or may not know, and providea test of discrimination to the dog who must ignore these and concentrate on the original scent trail. Sometimes dogs will accidentally flush quail, hares, or even kangaroos and this can create all kinds of problems for handlers, and great excitement for dogs! 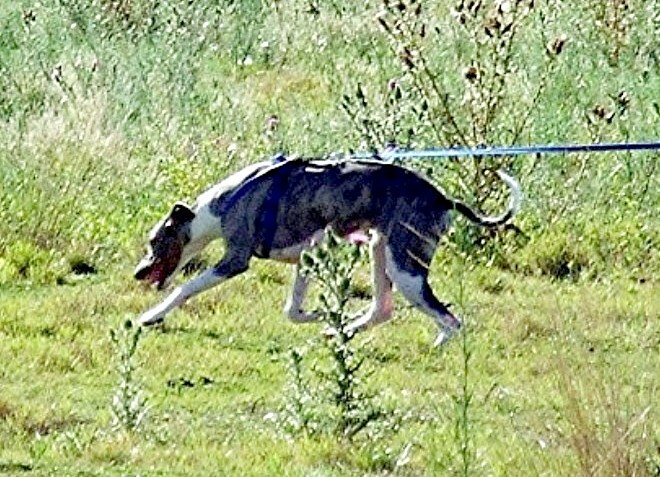 Training does not include teaching dogs to track as they are born with this ability. However, training does involve teaching them to follow only the scent of the primary tracklayer, ignoring all others (including wildlife). Dogs are also trained to give a positive indication of articles found in order to earn a passing grade. 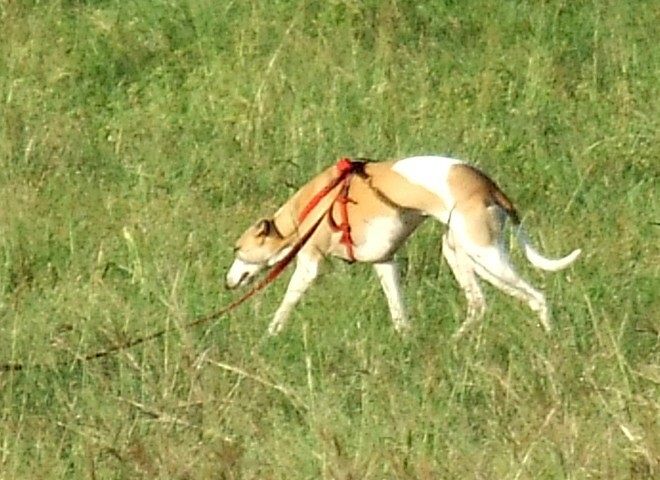 Training involves lots of practice, in all sorts of weather and in different locations, over different time frames to build the dog’s confidence so that it can work out the puzzles of the track by itself (remembering that the handler has no idea which way the track goes, and has to defer to the dog in competition). The handler has to learn how to read the dog’s signals and body language to know when it is on or off track, and then help when help is needed, but to otherwise just let the dog do its job. 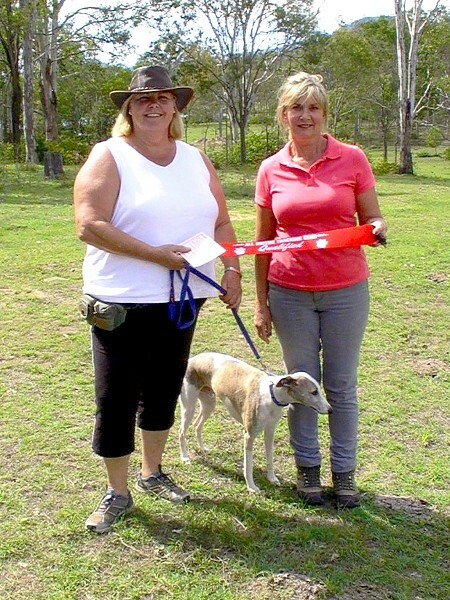 There are currently two 2 people in Queensland with Tracking Whippets - Graeme Baker and Jillian Broomhead, each having 2 Whippets active in the sport. Both Graeme's dogs, 'Freddie' and 'Nochie', are Tracking Champions, now involved in the new sport of Track and Search, which is only open to titled Champions. 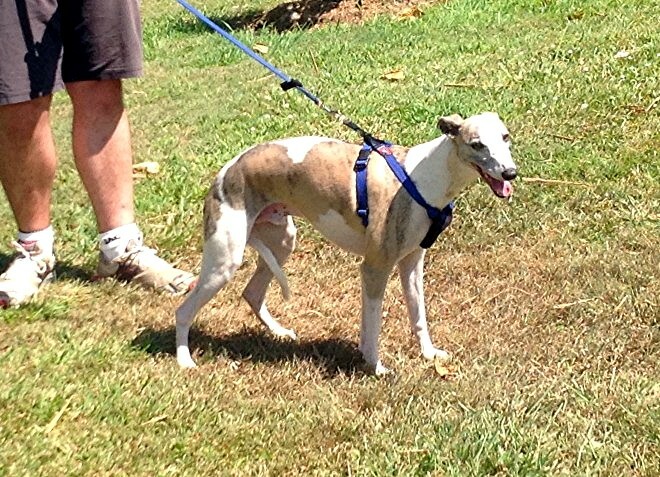 'Freddie', TCh Aslan DirtySexyMoney has his TSD4 (Track and Search Dog - Level 4) title, and was the first Whippet in Qld to earn the TCh title. Jillian's Whippets are 'Aeowen', TCh Lysnagah Spring Scarlett - TSD1, and 'Thorin", Lysnagah Spring Spirit in training for 2014.
Who said Whippets can't Track? Thorin, owned by club member Jillian Broomhead, only started started Tracking this year and Jillian is delighted to say he was just fantastic. He passed his TD3 to qualify for his Tracking Dog title, plus did an 800m track, 2 right angle corners and 2 articles in 7 minutes. Jillian says, the judge and she were panting messes at the end, but with one very happy and smug Whippet delighted to find his 'lost' tracklayer. Well done Thorin and Jillian!